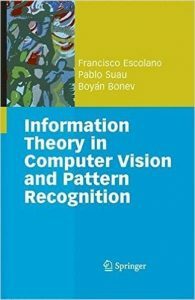 Information theory has proved to be effective for solving many computer vision and pattern recognition (CVPR) problems (such as image matching, clustering and segmentation, saliency detection, feature selection, optimal classifier design and many others). Nowadays, researchers are widely bringing information theory elements to the CVPR arena. Among these elements there are measures (entropy, mutual information…), principles (maximum entropy, minimax entropy…) and theories (rate distortion theory, method of types…).